The Lib/Lab show is also on in earnest in Rosstown. Labor too pushes the boundaries with its preferences but nowhere near how blatant the Libs are in Tucker. Determining who is truly ‘independent’ is difficult given that the phrase ‘inappropriate development’ is on practically everyone’s lips – as are countless other slogans. What irks us most is the cry to ‘keep rates low’ – especially from incumbents across the board. The truth is that Glen Eira for the past decade has had one of the highest annual rate increases in the state – 6.5% apart from one year when conscience got the better of them and they voted in an increase of slightly less. Were it not for the current rate capping, then the original proposal was that the 2016/17 budget would also include a 6.5% rate increase. Then of course, we need to consider the financial management and oversight provided by these incumbents. Council is now back up to the huge debt of $24 million, yet still splurges on mega palaces and still cannot bring in projects under budget and on time. Our position remains unchanged. If residents want a council that listens, that acts in concert with its community, then there is no option but to replace all incumbents. Pilling should start looking for another job. A green who turned blue all over and let Hyams/Lipshutz/Esakoff gang get away with blue murder as mayor. A disgrace! 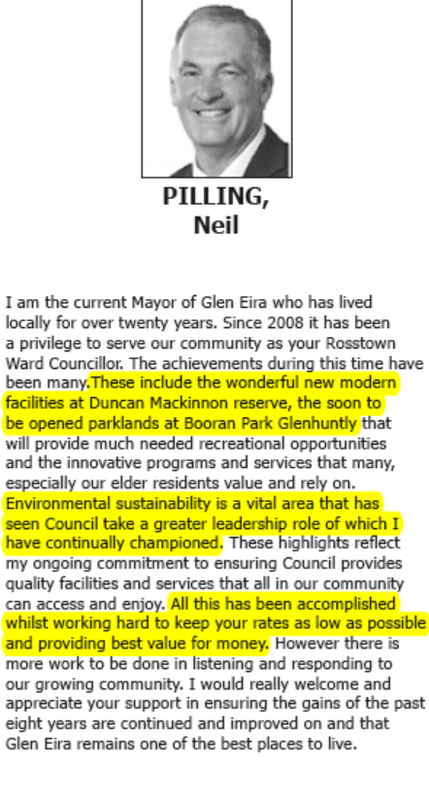 Pilling taking credit for Duncan McKinnon, Booran Road. Joke! As a resident I’m more interested in the knitting. A transport department that listens to residents. Street cleaning that is not a joke. Culverts that are cleaned. Not having to wait weeks to get basic repairs done. 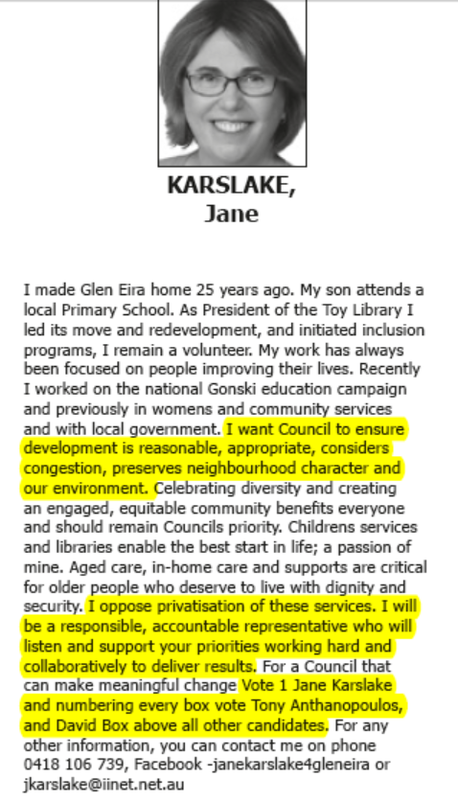 And as a Councillor whose mantra was openness, transparency and accountability, he’s walked away from all three. In camera meetings have never been higher. Let’s not forget he walked from the organisation that was the conduit for his election but did not have the integrity to resign after doing so. Without the Greens endorsement he would never have been elected. Plus I’m not keen on people who make a career out of being a Councillor. Billboards galore across Glen Eira now. Expensive campaigns. I wonder if Ck foods is funding Lobo’s campaign again? Pilling says nothing. 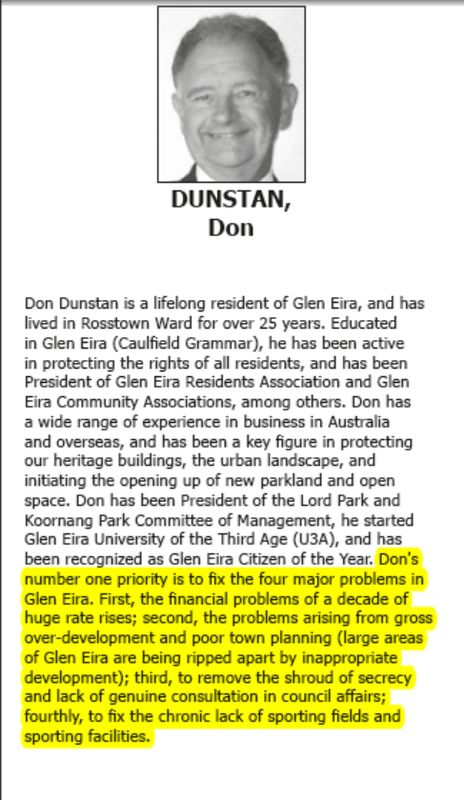 Dunstan pinpoints the problems but no solutions and Karslake speaks in cliches. Not that it’s fair to expect solutions in a 200 word blurb but he could have done a bit better. Pilling knows nothing so couldn’t say anything and Karslake is repeating what Delahunty has told her to say. All so very disappointing.